There is a relationship between molluscum contagiosum and eczema, though the nature of the relationship is not clear. People who have eczema are more likely to contract the molluscum virus. Children with eczema are more likely to become infected with molluscum. A small amount of people with molluscum lesions develop eczema around the bumps. The eczema that develops along with the lesions usually disappears once the papules have been resolved. 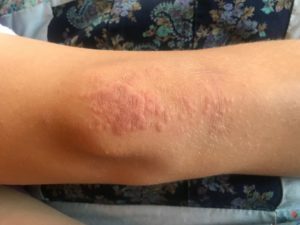 Some doctors think that eczema is the body’s response to the lesions as it usually appears when the lesions become inflamed and then clear up. Bumps are larger (pencil eraser size) and have an indented center. The center is white and waxy. Molluscum can make your skin feel dry but not itchy. Bumps can appear anywhere on the body but are most common on the torso, arms and legs. Eczema starts as a cluster of small blisters, but then turns into a scaly, itchy rash. 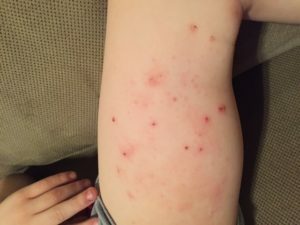 Eczema is not contagious and it cannot be spread to others. If you think you might have eczema, consider this question. Are your lesions itchy? It could be due to the surrounding patches of eczema. Be very careful not to itch the molluscum lesions to the point of exposing the white waxy center. This can cause the molluscum virus to spread. You can see with these molluscum lesions, there is a bit of eczema surrounding the bumps. For people who have eczema, they can take precautionary measures to avoid contracting the molluscum virus, such as not sharing baths or personal items like soap, hair brushes, clothes, towels or razors. They should wipe down any workout equipment before using and wash their hands thoroughly. They should avoid scratching irritated skin to make it more difficult for molluscum to find an entryway into the skin where it can settle and spread. It should be noted that eczema is self-inoculating meaning it cannot spread to other people. Molluscum cannot be pre-emptively treated and must be diagnosed by a doctor. It is impossible to know whether or not you will develop symptoms of molluscum or eczema until a breakout occurs due to the incubation period of molluscum. This period can be up to several weeks or months long. It is recommended to still take precautionary measures. Although molluscum is more common in those with eczema, it should still be noted that there are several skin conditions such as warts, herpes and acne that are often confused with the lesions, so if you have any skin irritation, bump, blister, or rash that lasts more than a few days, you should see a medical professional who can correctly diagnose it.